Retired U.S. Army General Eric K. Shinseki was nominated by President Barack Obama on December 7, 2008 to serve as Secretary of Veterans Affairs. His nomination was confirmed by the Senate on January 20, 2009, and he was sworn in as the seventh Secretary of Veterans Affairs on January 21, 2009. Secretary Shinseki served as Chief of Staff, United States Army, from 1999 to June 11, 2003, and retired from active duty on August 1, 2003. During his tenure, he initiated the Army Transformation Campaign to address both the emerging strategic challenges of the early 21st century and the need for cultural and technological change in the United States Army. Following the September 11, 2001 terrorist attacks, he led the Army during Operations Enduring Freedom and Iraqi Freedom and integrated the pursuit of the Global War on Terrorism with Army Transformation, successfully enabling the Army to continue to transform while at war. 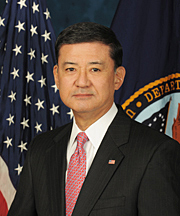 Prior to becoming the Army’s Chief of Staff, Secretary Shinseki served as the Vice Chief of Staff from 1998 to 1999. He previously served simultaneously as Commanding General, United States Army, Europe and Seventh Army; Commanding General, NATO Land Forces, Central Europe, both headquartered in Heidelberg, Germany; and Commander of the NATO-led Stabilization Force, Bosnia-Herzegovina, headquartered in Sarajevo. He was commissioned a second lieutenant of Artillery upon graduation from the United States Military Academy in June 1965 and was assigned to the 2/9th Arty, attached to Company A, 1st Battalion, 14th Infantry Regiment, 25th Infantry Division as a forward observer from December 1965 to September 1966, when he was wounded in combat in the Republic of Vietnam. He returned to Tripler Army Medical Center, Honolulu, Hawaii to recuperate and subsequently was assigned as Assistant Secretary, then Secretary to the General Staff, U.S. Army, Hawaii, Schofield Barracks, from 1967-1968. He transferred to Armor Branch and attended the Armor Officer Advanced Course at Fort Knox, Kentucky, before returning to Vietnam a second time in 1969. While serving as Commander, Troop A, 3d Squadron, 5th Cavalry Regiment, he was wounded a second time in 1970. Other assignments include Commander, 3rd Squadron, 7th Cavalry, 3rd Infantry Division; Commander, 2nd Brigade, 3rd Infantry Division; Deputy Chief of Staff, Support for Allied Land Forces Southern Europe; Assistant Division Commander-Maneuver, 3rd Infantry Division; Commander, 1st Cavalry Division, as well as G-3, 3rd Infantry Division, 1984-1985; G-3, VII US Corps, 1989-1990; and Deputy Chief of Staff for Operations and Plans, Headquarters, Department of the Army, 1996-1997. Shinseki holds a Bachelor of Science degree from the U.S. Military Academy at West Point, a Master of Arts degree from Duke University, and is a graduate of the National War College. Secretary Shinseki was awarded the Defense Distinguished Service Medal, Distinguished Service Medal, Legion of Merit (with Oak Leaf Clusters), Bronze Star Medal with “V” Device (with 2 Oak Leaf Clusters), Purple Heart (with Oak Leaf Cluster), Defense Meritorious Service Medal, Meritorious Service Medal (with 2 Oak Leaf Clusters), Air Medal, Parachutist Badge, Ranger Tab, Joint Chiefs of Staff Identification Badge, and the Army Staff Identification Badge. He currently lives in Falls Church, Virginia, with his wife Patty. Update: Gen Shinseki resigned the VA Secretary post in 2014.